Gregor Townsend at BT Murrayfield ahead of the Scotland squad annoucement. He may not have got an official namecheck but Gregor Townsend hinted yesterday that an “arrogant Englishman” deserves some credit for strengthening the Scotland squad available to him for next month’s autumn Test matches. Richard Cockerill, who described himself as such earlier this week, has overseen a significant improvement at Edinburgh in the past year which has been reflected in the most even split in a national squad for some time. Edinburgh have 15 players to Glasgow’s 16 in the 40-man squad for the games against Wales in Cardiff and the BT Murrayfield Tests against Fiji, South Africa and Argentina, which take place on consecutive November Saturdays. In recent years Glasgow have provided the lion’s share of the Scotland squads but Townsend welcomed the fact Edinburgh were now sharing more of the burden. “That [the improvement under Cockerill] is why there are more Edinburgh players involved and the numbers from Edinburgh have gone up,” said Townsend. “There are more forwards from Edinburgh and more backs from Glasgow but we are seeing Edinburgh backs coming into the squad and challenging the established players from Glasgow. It is a healthy balance. Edinburgh wing Dougie Fife is one of the capital players to be recalled, while Townsend admitted the upcoming weeks presented a big opportunity for 21-year-old full-back Blair Kinghorn, right, in the absence of injured superstar Stuart Hogg. “Blair is obviously favourite to play full-back for us,” said the Scotland coach. “He had a really good season last year, got his first taste of international rugby on the wing, also played at full-back in the Canada [summer] Test. I thought he did well on the wing – scored a couple of tries against the USA and Argentina. There are parts to his game that are outstanding: his athletic ability, his speed, his rugby awareness and his kicking game. One Edinburgh man to miss out is 21-year-old wing Darcy Graham, but he along with young flanker clubmate Luke Crosbie have been invited to train with the squad. “Darcy has been excellent the last two weeks,” said Townsend of the Hawick man’s performances against Cheetahs and Montpellier. 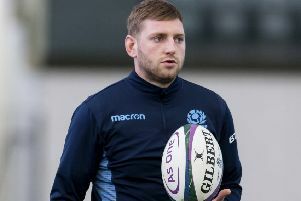 Hogg’s absence means that Scotland will be relying even more on their other attacking spearhead, stand-off Finn Russell, who has made a positive start to his new career chapter in Paris with Racing 92. “I saw Finn at the beginning of September and just before his second game, against Clermont,” explained Townsend. “Obviously we watched all his games. He’s playing well, he has started the season really well, his first four or five games were excellent. That’s a credit to him because it’s a really tough environment to go into. Speaking a different language and adapting to a different way of playing he seems to be communicating very well on the field, I don’t know what language it’s in but he’s talking a lot to the players around him! Townsend admitted that he has picked his squad with the knowledge that next year’s World Cup in Japan is now less than a year away. “In the back of our minds, yes, I believe everyone in this squad can play in the World Cup,” said Townsend. “There are a few outside the squad as well. But the World Cup had to be in our minds. We’re entering a period where there is less than 12 months to our first game. Townsend will be without his non-Scottish based players for that extra opening Test against Wales in Cardiff on 3 November, including the uncapped call-ups Sam Skinner and Blade Thomson. Townsend defended the decision to play that extra Test match outside the official window against the Welsh, returning to the scene of his lowpoint since taking the national reins when the Scots were thumped in this year’s Six Nations opener, which will see the two nations compete for the inaugural Doddie Weir Cup. “We are a team that doesn’t usually play four Tests but everybody else and most of the teams in the northern hemisphere do,” he said.